It’s been a while since I posted. The cafe I work in gets crazy busy during the Edinburgh Festivals so August was manic, and I haven’t had the same amount of time to deliver accounts to Division Commissioners and organise planning meetings as I usually do! Now that things this week are getting back to normal I thought I’d share some ‘Getting to Know You’ ideas that I’ve used in various settings for both training adults and working with young people. I’ve used this at Senior Section this week, as we have a new volunteer and two new starts. This worked really well. The idea is that each person (including leaders) are given a grid with different facts about a person. For example ‘Someone who has an older brother’ or ‘Someone who goes to a different school from you’. The idea is that you have to mingle with people in the room to find people to match each one. You can only use each person in the room’s name once (although if you have more spaces on the grid than people show up to your meeting, I say that if you’ve used up everyone in the room on your list, you can use a person no more than twice!). You can at the end gather in a circle to discuss what they found out about each other as a result. Everyone stands in a circle. Go around the room and introduce yourselves. After that you say a name then throw the ball to that person. Continue until everyone has had a turn at catching the ball. You will need an even number of people to participate in this game. Take out your cards and put them into pairs. Only have enough cards for everyone in the room participating. Shuffle the cards and hand them out. Each person has to find the person with the card that matches their own (ie Queen of Clubs and Queen of Spades, 3 of Hearts and 3 of Diamonds). Once everyone in the room is in a pair, shout out something that they should share with each other. It could ‘Your favourite Guiding memory’, “your favourite subject at school and why”, “your goal for what you’d like to do at Guides this year” etc. Everyone sits in a circle and passes around a roll of toilet paper. They are told they can take as much or as little toilet paper as they like. Once everyone has done that, they should pass their sheets of toilet roll to the person beside them. After that, for every sheet of toilet roll they share a fact about themselves. Everyone is given a pen and piece of paper, and some time to think of three facts about themselves. Two will be true, one will be a lie. You can either do it so that everyone shares in a large group one at time their three facts and the group has to guess. Or you can ask them to pair up with someone they don’t know very well and share their facts with each other. Then in a large group the other person tells the group which fact they think is the lie. The latter way works better if you have a group of people that includes friends that know each other very well. Everyone sits in a circle, and person with the ball of wool shares their name and a fact about themselves before unravelling some wool and throwing it to another person in the circle. Eventually you should have a tangled web where everyone in the circle is connected by the web of wool. Are there any good ‘getting to know you’ games that you’ve used in the past that I’ve not shared about? Please do in the comments – I’m always looking for new ones! As this term comes to an end, I’m sure some of you will have new members coming up to your section after the Easter Holidays. In January, I had a brand new group of Senior Section girls that meets on a different night from the original group to extend the opportunities to be part of a Ranger style group in our area to meet demand. In addition to this, I’ve had three new members come to the original group this term, and two new ones last term adding some new dynamics. On the first meeting of the new group, I decided at the last minute to use what I call ‘Girlguiding Bingo’. It’s a variation on an icebreaker I’ve learned in another places. I basically use Word to make a table with 9 ‘cells’ and fill them with different combinations of facts about a person. Some will be Girlguiding related, others just general interests, likes or dislikes. The idea is that they have to get up and go around the room and speak to people to find out if they fit any of the facts on their bingo sheet. I’ll then print these up. Usually when I’ve not done it in a rush like I did on this night, I’ll leave space for the girls to write names in each box. The girls can’t use the same name more than once (if you have a big group) or twice (if you have a smaller group). 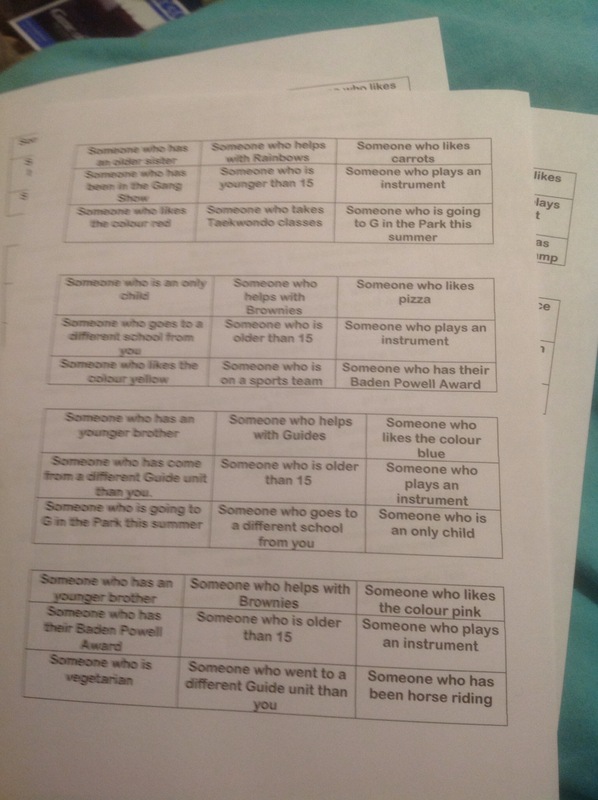 The first girl to get someone for all the different boxes on her sheet calls ‘BINGO’. It’s a useful way of people getting out of their comfort zones. I’ve found putting the things like ‘someone who came from a different Guide unit’ and ‘someone who goes to a different school’ and ‘someone who is older than you’ can help the girls mix a little bit more. Often conversations get going as they discover they have similar interests they weren’t aware of before, or are interested to find out more information about each other they might not have found out otherwise. It is how I found out that no one in the second sub group of the Senior Section help out at Rainbows! (At least two or three of the girls who meet in the first sub group are Rainbow Young Leaders). Do you have any useful icebreaker activities you have used with your Senior Section units? Well it’s been a tumultuous, frustrating and challenging week as a Senior Section leader as less than two weeks after going through the Young Leadership Qualification and giving packs to all the girls…Girlguiding changed the syllabus. At least a few Leaders in our area had not realised that there was a Young Leadership Qualification the girls could do when they were 14 and that it was not just ‘Module 1’ of the Adult Leadership Qualification (which seems to now be called simply ‘Leadership Qualification’). So. I thought I’d share my knowledge after spending almost every evening this week undoing the work of the last 6 months-year, which was spent trying to get the correct information and correct packs to the girls who are Young Leaders. Plus I know there are other Leaders out there who are confused about what the girls can and can’t do. All our girls who are under 18 have decided they want to do their Young Leadership Qualification before going on to do the Adult version. Girls can start their YOUNG Leadership Qualification when they are 14 if they are volunteering at a Rainbow, Brownie or Guide unit. The new syllabus in a downloadable workbook format can be found if you click here. The girls do not need a mentor who has done mentor training like they do for the adult version. Any leader can be their ‘supporter‘ (which is the equivalent of the mentor role). This can be one of their Senior Section leaders, one of the Leaders of the Unit they volunteer with or their Young Leader Adviser. I would probably recommend encouraging the girls to choose someone they get on well with and has done or is going through a leadership qualification so they can give them good advice and understand what is involved. Also, if you are a Young Leader Adviser/Senior Section Leader/District Commissioner, I would recommend encouraging any unit leaders with Young Leaders volunteering to check out this document from Girlguiding which is really helpful. I would also suggest encouraging the girls to keep evidence of what they’ve done – especially if they are showing signs of wanting to continue onto the Leadership Qualification. This way they have already put the evidence keeping skills into practice, and I imagine it would be easy to use some of their YLQ stuff to count towards their Leadership Qualification where applicable. But that’s just my own opinion! Girls can start working on their (adult) Leadership Qualification from the age of 16. Elements of their Young Leadership Qualification can count towards their (adult) Leadership Qualification as long as there has not been too long a gap between finishing their YLQ to starting their adult one. Much of the Young Leadership Qualification has the same principle elements as Module 1 and bits of Module 2 of the (adult) Leadership Qualification. They will need to speak to their District Commissioner to get their Disclosure/PVG check done, their leadership qualification booklet and a mentor. They will not be awarded the qualification until they are 18. Once they are 18 they can wear the ‘Adult Member’ uniform if they wish and become an Assistant or Unit Leader. You can find some more information on the Senior Section website here. You know when you want to write a post, and then another fantastic blogger writes exactly what you’d want to write. Only more eloquently? Well that’s what has happened today. There’s a great post on Kelloggsville’s A Guiding Life blog about moving Guides up to Senior Section which I couldn’t agree with more. What do you think we can do as leaders to help girls be more comfortable and confident moving up to the next section of Girlguiding? Would love to hear your thoughts!